Living somewhere with little to no light pollution means I do see the sky lit up on cloudless nights and now take a keener interest in astronomy. Orion is clearly visible in the winter months and Rigel is the brightest 'blue' star in that constellation. 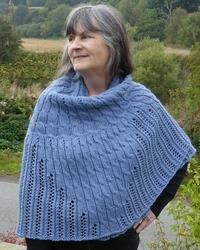 This stunning cable and lace shawl may look intimidating but it is intuitive once you get going and easy to memorize. Project Size: Width 61"; Depth 28"